If you've been following my previous posts - I talked about how things have been quite busy the last few weeks - and they still are. Right now, there is a lot of work I have to do with regards to the Masters programme I am doing - so unfortunately that means a lot of personal projects have been put on hold. I will be most likely continuing on Foundation of Civilisation later on - once things have settled down. I will also be continuing on pixel art practice once things have settled down. I may also decide to do more analysis type posts - perhaps going further than Embedded Narrative or simply broad analysis of concepts of other areas [such as economics] and their application to games. These would hopefully be both helpful and insightful to help guide design choices and even get ideas among other things! Recently I have conducting research on Embedded Narrative and the repeating aspect of the New York Hell's Kitchen area within Deus Ex, released in 2000 by Ion Storm. It has been proving to be an insightful look into rewarding players willing to explore and read the material left around by explaining events in the world through multiple 'channels'. For instance - when you first arrive in Hell's Kitchen from the subway, you are able to access a Public Access terminal that has a few articles and announcements about what's happening in the game world. The first entry talks about a chlorine leak poisoning the Hudson river and causing problems in one of the water purification plants. Further on through the level - you may choose to investigate the sewer areas - after being provided a key and asked by a smuggler to go rescue a friend of his. If you choose to do so - you will discover a group of what appear to be private military individuals. One of the data pads simply state that they are there to covertly observe a warehouse in the area. However once you do some more investigating - you discover that they set up base in one of the water purification plants - and have been administering chlorine into the water supply from the plant. Here we have simply one story that a player can discover and learn about. All these different approaches and channels funnel into delivering the information and story for the player to piece together as they explore the environment. 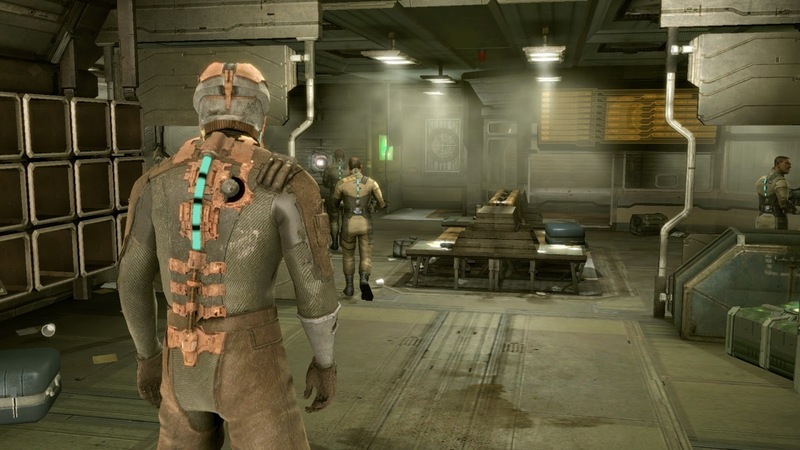 The game also mentions places that the player will be going to later on [Brooklyn Shipyards] and also lays the foundation as to what, why and how what will happen was able to take place. 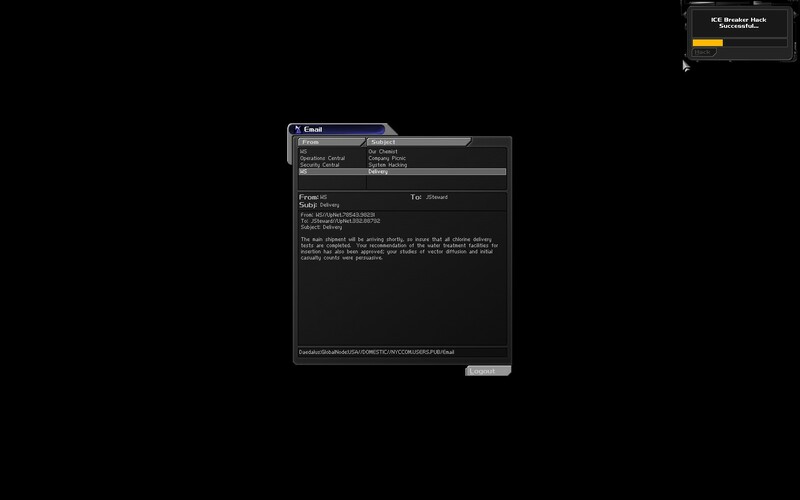 An insight that can be taken from Deus Ex's approach to relaying information about events is to take different approaches. What a player can learn about in a news paper article, you can then reinforce and provide further information in a e-mail. Piecing these specific pieces together provides both an interesting way for you to provide information about the game world, and what the player is seeing and experiencing! The last week has been very busy with University work - and it seems that the next few weeks will likely be the same. I may have to pause on pixel art for a small while - whilst I work on University work. 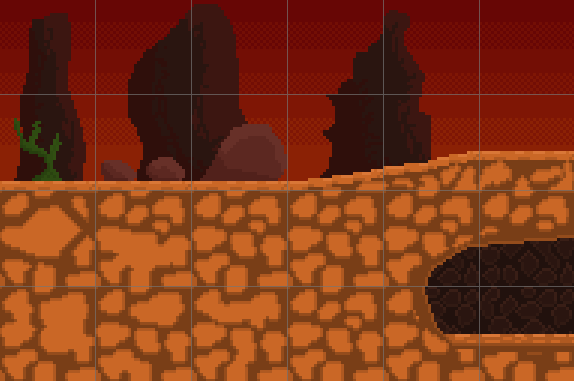 I have been playing around with layers in Pyxel Edit and trying out different ways of making the same tile / object re-usable in a way that it appears to be different. This can be seen with a number of the objects in the below image - such as in the background, the cave rocks and the shrub on the small elevated piece of terrain. The last few weeks I have been reflecting more and more about the usage of economic concepts and ideas in understanding games. Among the benefits of using economics within game development - we can use it to help guide design decisions - should we add a new quest to the game that will reward player a sizeable amount of currency? Should we instead give the player an item reward? These may sound as questions linked to balancing - however economic ideas help with other design decisions such as how many types of currencies do we have? When talking about a MMORPG [I will be speaking of MMORPGs primarily but realistically - this counts for most games that have a persistent world / economy with large numbers of players] - the concepts of economics seem to be more apparent and clear. Whilst developers often are able to control an economy of a non-MMORPG - the same is more difficult and intricate within an MMORPG setting. For the sake of ease when discussing contrasts - I will also be thinking of single player RPG games when I refer to single-player games. I decided to reflect broadly on these ideas within this post - I may decide later on to explore more specific ideas and situations - however I have yet to decide on this. I will also be speaking in more simplified definitions and terminology - and should I choose to explore the topic more, might delve into the more specific definitions and terminologies. These are simply reflections so of course, do not take these to be facts or necessarily true, they are simply a few thoughts that came to mind when reflecting on economics and game economies. So look at this post as a simple sharing of thoughts so to speak. As one of the fundamental concepts in economics - Demand and Supply are elements we can likely envision the most in a game setting. If a player demands an item - health potions, equipment, cosmetic items and so on - then they may be willing to attempt to acquire it. In a single player game - these often involve finding them in the world - or simply purchasing it from a Trader using the in-game currency. 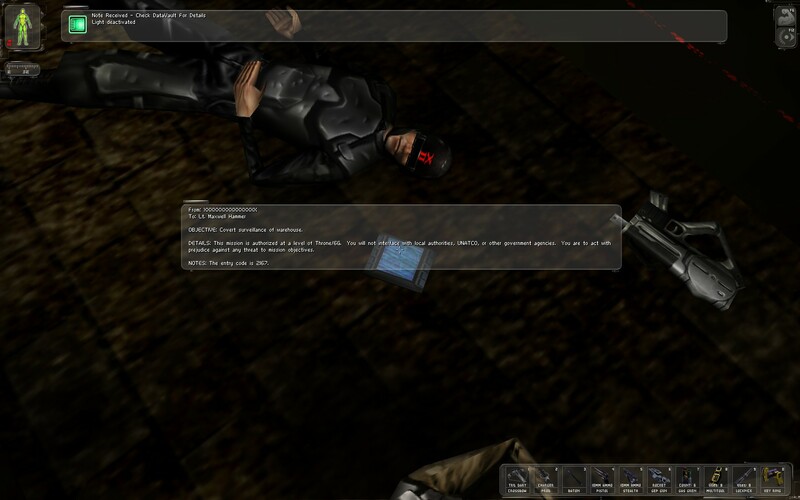 In an MMORPG - the situation becomes more a bit more interesting - at least in my point of view. Demand in an MMORPG - especially where a Trading Post, Auction House or similar is available that allow players to place purchase orders and so on - is often influenced by a lot of factors beyond the usage of the item. In games such as Guild Wars 2 - players purchase skins, mini pets and tonics that have little functional purpose in the game outside of aesthetics. 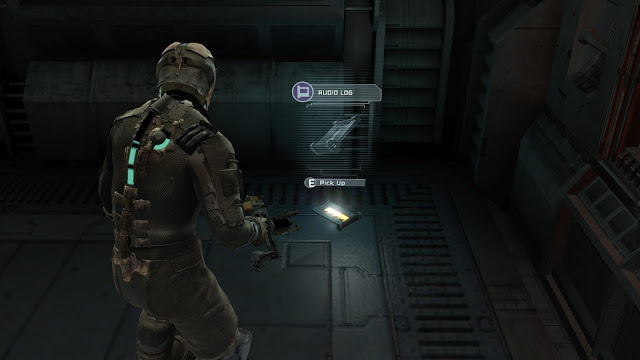 The same can be said in single player games - however in a single player setting - the developer can balance out items to attempt to ensure different types of players have what they want. Which brings us to the concept of supply. Supply refers to the amount of a particular item available within a market. In a Trading Post - these are offered up by other players - who choose how much to charge for the item itself. This shift from developers having control of prices within single player games to often having to alleviate at least a little control to players begins to show us a better picture as to why economics is useful to game developers. As a developer in an MMORPG who is about to introduce new content to the game - it is worth noting at least what the effects of the new content will be on the game itself in terms of it's economy. Player demand and supply will shift and change as the game goes on - and a lot of new content is often a major driver towards this change. If one were to look at a number of items in games such as Runescape before and after the introduction of Raids - one can see how players would demand more of a specific item they believe will be valuable - often driving up the price of the item. Another consideration is when you add too many quest and rewards - but not enough ways for players to spend their rewards if it is currency. When there is too much currency within a game economy - what is likely to occur is that the general price level of goods will rise - in a general way of speaking, each gold coin is worth less in terms of purchasing power. The implications here mean that older quests become meaningless in terms of currency rewards unless adjusted to the inflation. This means that in the early game - we can't count on players to interact as much in the player economy - and may have to settle for NPC traders; or as it sometimes may be the case - the players may decide to skip the quest and content entirely. Realistically - it is difficult to keep in mind all the concepts and effects a particular decision of piece of content may have. Sometimes - players will simply surprise you or act in ways you didn't even consider. Regardless - Economics is something I believe could be beneficial to look into for developing games - perhaps more so for games with persistent economies rather than others. Understanding a few of the fundamental concepts so to speak could be enough to prove beneficial; then perhaps looking into other concepts if you feel like they may be more useful or insightful or simply interesting! During the last week I've been experimenting and trying out a few ideas on the background. Usually I would try to use a slightly opaque or light colour to make distant objects. This time around - I decided to try out a new approach by adding a layer that darkens background objects to seperate them from the foreground. I definitely like the result! 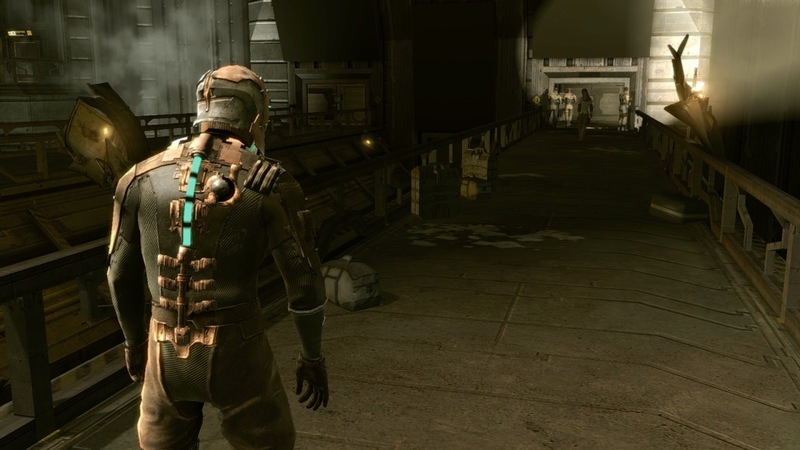 This week I decided to bring forward a small analysis I did for the first 10 to 30 minutes of Dead Space (Visceral Games, 2008) - approximately the first chapter. The analysis was in regards to Embedded Narrative - for those of you who are unaware of what this implies - think of it as methods through which a develop can tell a story through the environment and objects within the environment. A few examples of these include codex entries, notes, environment objects, audio logs and markings. When conducting my analysis I tried to take on the role of a new player who has yet to play the game itself. Using the environment - I attempted to interpret and imagine what possible could have taken place. 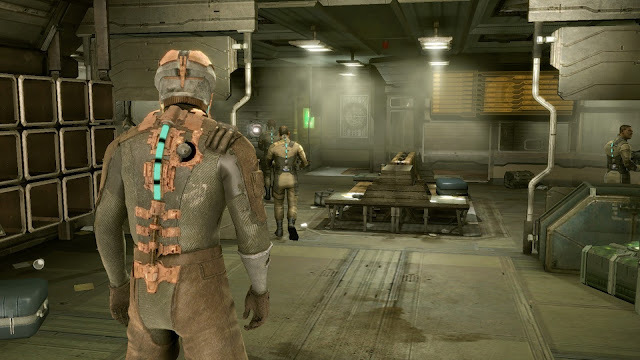 We will be interpreting what we see based on the environment - assuming that we have next to no knowledge on what the state of the story is within Dead Space. The analysis will be done sequentially - from when the game gives us control of the avatar to around the end of Chapter 1. From the start - as we depart from our crashed maintenance ship - we walk onto the docking bay area bridge which seems to be filled with luggage bags. Whatever happened - we can possibly assume that it was sudden - and people seemed to be just arriving or just departing from the ship just before or during what was happening. As we make our way into the ship - the amount of luggage left around the waiting area, coupled with coffee cups and what appear to be stains (stains of what exactly is debatable - is it just coffee or blood?). This seems to reinforce what we already assume - that whatever happened - it was sudden. As we walk around the security desk in the lounge we are presented with a large quantity of blood stains. Arguably the first signs that whatever happened - people got hurt. However - what was it? Were people rioting because they were kept out of the ship? Were they being forcibly kicked out? Were they being quarantined? Also if conflict did occur - where are the bodies? Was it settled without casualties and people were taken to an infirmary? Some initial thoughts would be how did they get on the ship? Who or what are they? What lead to this? Where are the crew and where are the bodies if they are not alive? Do these aliens take the bodies of the crew members? As we escape one of the aliens chasing us through the back areas from the security desk - we arise to this. Perhaps the most significant feature in this room aside is the dead crew member and the writings in blood. This tells us two key elements - the crew did survive the initial attack by the aliens - and they are fighting back. 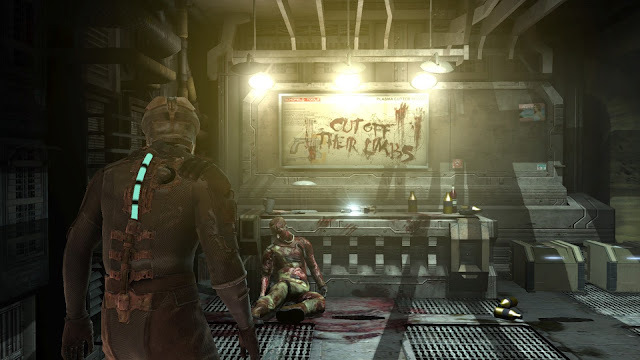 As we collect the plasma cutter from the desk we can assume what that the instructions written in blood are instructions towards killing the aliens. Presumably - the crew member was dying - injured by one of the aliens - and wanted to leave a message for any other person to find so they do not suffer the same fate. As we move forward from the maintenance room we locate an audio log - which follows a crew member named Bensen and a group of survivors. From the audio logs we can't be sure how long ago they left these here - but it is a possibility that the crew member found dead - was part of Bensen's group. 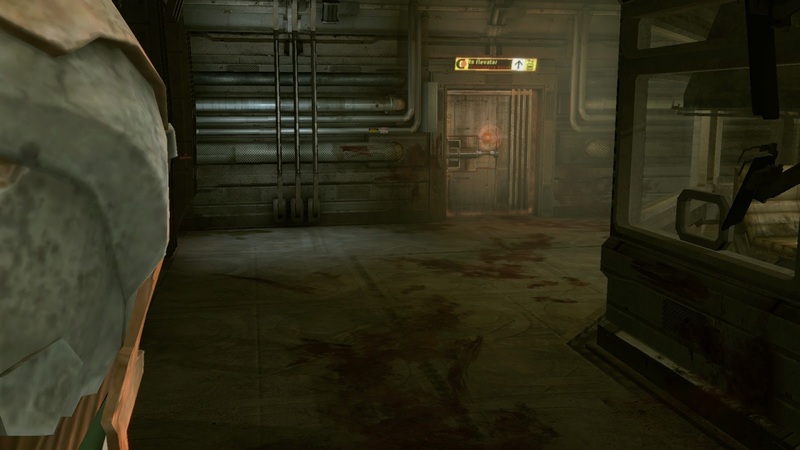 Leading us to believe that Bensen and his group could be alive. As we continue moving forward we find this scene. At this point - we have no idea how ago this had taken place - and who these individuals were. However as we make our way forward it becomes more clear. 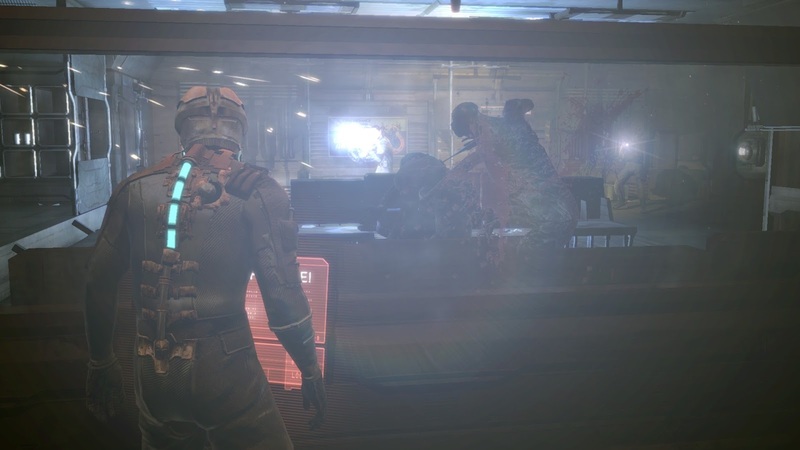 An audio log within the Tram Maintenance room tells us that Bensen and his group were attempting to repair the Trams to try to reach a different area of the ship - but they needed a stasis module. Presumably - these individuals might have been the ones bringing the stasis module to Bensen and his group - however we can only speculate on this point. By the end of chapter 1 - we know that aliens were clearly what caused the USG Ishimura to require assistance. We know that there was a group of survival alive - but we have no clue as to what happened to them. We also know that the alien attack was sudden and unexpected - and that the body count seemed low relative to the size of the ship up to this point. Whether this means the ship had a small crew - or the aliens are taking the bodies somewhere - is unclear. This analysis highlights the potential use that a number of techniques using simply the environment could have for relaying information and story. Embedded Narrative is often used to tell a story of past events - encouraging players to piece together an idea of what took place before they arrived. However it can also be used to teach the player in a diegetic [Diegetic meaning that it lies within the story world - think of it as the player character is aware and can see/manipulate/hear it etc...] manner. 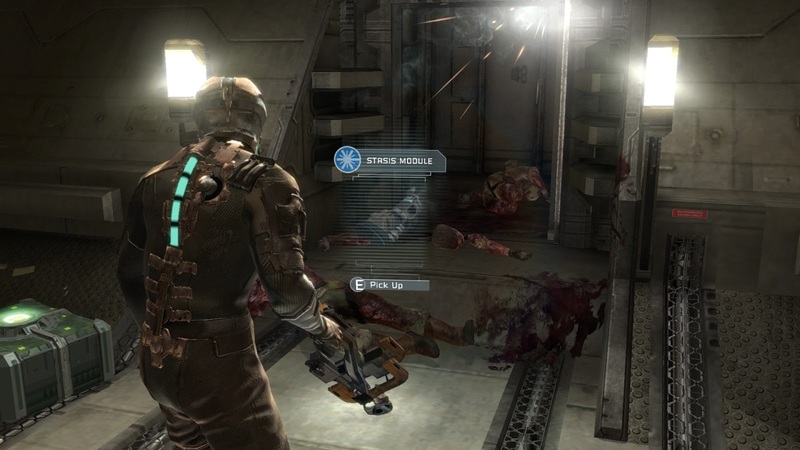 Through simply embedded narrative elements - we were able to piece together a large amount of information with regards to Dead Space. [Spoiler Alert] Those of you who have played Dead Space would know that the 'Aliens' were Necromorphs as they are known within the game world - brought onto the ship - which answers two of our questions as to where the bodies were - and how the attack happened and how sudden it likely was. Hopefully this has been a useful analysis that might have given you ideas on how to use Embedded Narrative elements within your projects - or simply as an entertaining read if that is what you're looking for!